Did you know that most of the ocean has never been seen by humans? Less than 5% of it has been explored. This creates many exciting opportunities for new generations of explorers and scientists. New tools such as underwater robots and new sensors are greatly increasing our ability to explore the unknown parts of the ocean. The ocean is the last great frontier, and a wonderful and exciting challenge. 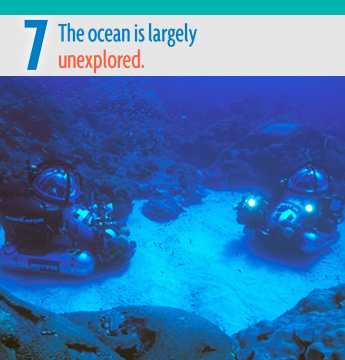 7: The ocean is largely unexplored. a. The ocean is the last and largest unexplored place on Earth—less than 5% of it has been explored. This is the great frontier for the next generation’s explorers and researchers, where they will find great opportunities for inquiry and investigation. b. Understanding the ocean is more than a matter of curiosity. Exploration, inquiry and study are required to better understand ocean systems and processes. c. Over the last 40 years, use of ocean resources has increased significantly, therefore the future sustainability of ocean resources depends on our understanding of those resources and their potential and limitations. d. New technologies, sensors and tools are expanding our ability to explore the ocean. Ocean scientists are relying more and more on satellites, drifters, buoys, subsea observatories and unmanned submersibles. e. Use of mathematical models is now an essential part of ocean sciences. Models help us understand the complexity of the ocean and of its interaction with Earth’s climate. They process observations and help describe the interactions among systems. f. Ocean exploration is truly interdisciplinary. It requires close collaboration among biologists, chemists, climatologists, computer programmers, engineers, geologists, meteorologists, and physicists, and new ways of thinking. Real-time data portal: An interactive map that shows the latest weather and ocean observations including winds, waves, air and water temperature, salinity, right whale presence and more. Graphing and Download Tool: Provides easy access to data on past conditions that can be viewed and analyzed. Text a buoy and Dial a buoy: Tools that allow mobile access to the latest weather and ocean observations. Wave Height and Direction Forecast: Maps depict predicted wave conditions across the Gulf of Maine 48 hours in the future. Coastal Flooding and Erosion Forecast: Decision support tool uses forecasts of water level and waves to predict coastal damage. Ocean Surface Currents: Maps show speed and direction of currents based on data from high-frequency radar. Ocean Climatology: An interactive tool that displays the average ocean and weather conditions from buoy locations throughout the northeast. Ships at Sea – Link to the 4 major American ships exploring the sea floor.